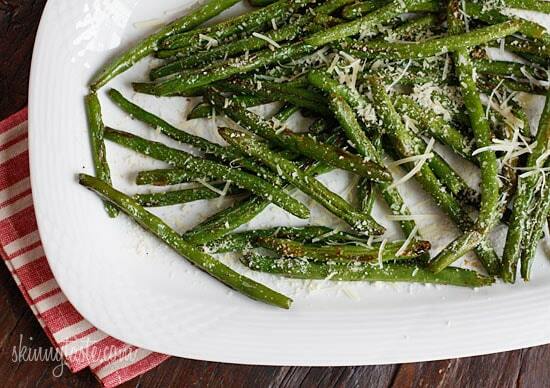 Roasted Green Beans topped with Parmesan come out perfectly charred and tender – SO good, I can literally eat the whole batch and made with just four ingredients! 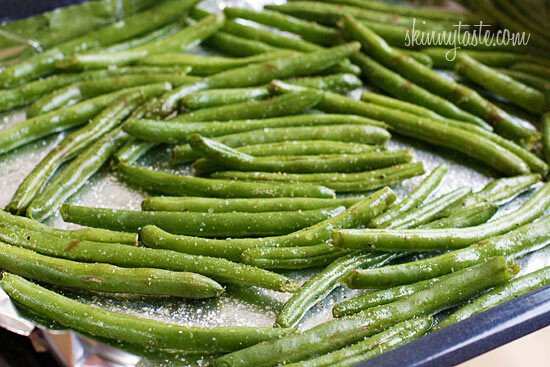 I am not a fan of boiled or mushy green beans, which is why I love them roasted. They come out tender yet crisp and are so delicious, especially as a side to a dish like Rosemary and Lemon Roasted Chicken! Try these wrapped in bacon too! 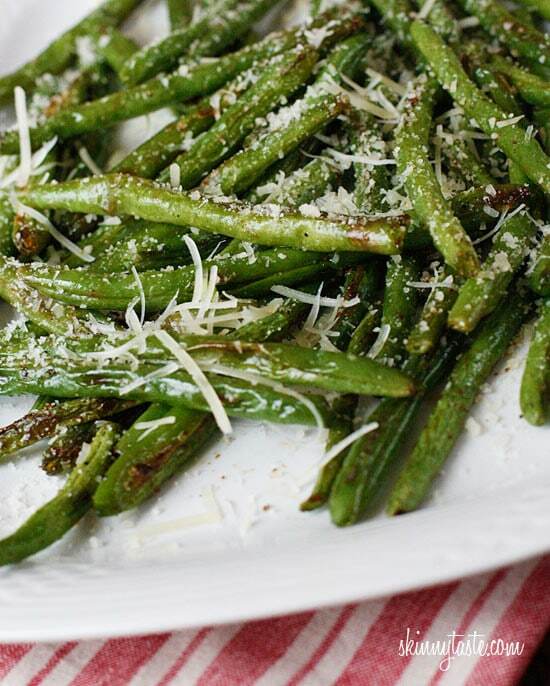 And if green beans aren’t your thing, you can try these with Asparagus. An easy side dish I make quite often, you can season them however you like, add some crushed red pepper for a little kick or leave the Parmesan off to keep them dairy-free. If you want to double the recipe, I suggest using two baking sheets. Serve them immediately out of the oven for best results. Spread them out on the sheet so that they all lay flat and place on the lower third section of your oven. Bake 10 minutes, shake the pan to turn; bake 5 additional minutes. Remove from the oven and sprinkle with grated cheese. Green beans are among my least favorite veggies but after making this recipe my entire family devoured them! So delicious! If I double the recipe and use 2 baking sheets, can I bake them at the same time? We bake them…wonderful! AT WHAT DEGREE??????????????? This is so simple, yet it may be my favorite ST recipe. We make it probably once a week– the salty cheese makes the green beans so delicious, and it’s SO easy. We also just use spray EVOO. So easy & so good!! Roasted the beans with EVOO, balsamic, garlic powder, S&P for 20 min @400. Then put a piece of prosciutto down and grated a little fresh parmesan, drizzled a little fresh lemon, added some of the roasted green beans on top and rolled everything up, secured with a toothpick. Finishing each roll on the grill to serve with big fat bone in grilled pork chops, grilled nan bread with honey goat cheese and some nice red wine. Also adding good music and wonderful friends! Wow. This makes cleaning fresh green beans worth the effort. Love the parmesan! My entire family loved this. We’ll put this on our fave list! Thanks. I’ve made these quite a few times and they are wonderful! Passed them on to my daughters and they and their family love them too! We all love Skinnytaste!! Keep ’em coming! Amazing! I threw some cherry tomatoes and whole garlic cloves in too. Delish!! Made 2lbs of these for the family yesterday…wish I’d made 4lbs-ALL eaten very quickly! Will be making again. Pingback: New Favorite Meal – Hey, Haley! My family really liked these green beans. I am always looking for ways to spice up sides. Thank you! Being in my 50’s I’ve cooked many green beans many different ways and this is my all time favorite. So easy and simple. I followed the recipe exactly except I used the middle oven rack. Simple enough for everyday. Good enough for guests. So simple. I usually don’t even like green beans, but I love these beans. I sprinkled with crushed red pepper for a little heat. Amazing!! Thank you!! Pingback: Vegetarian Recipes for Kids That are Healthy and Taste Great, Too! This is definitely a keeper! Very simple & quick. I am going to stop at 10 minutes next time, it was plenty done for me. Would not change a thing, really like the garlic powder & Parmesan. I cooked these at 400 degrees since I was roasting radishes on another sheet pan. I used fresh garlic and left off the cheese. I think I’d use garlic powder next time since the fresh garlic got a bit dark. We enjoyed the crispness that roasting gave to the green beans. Hi! Could I make mushrooms alongside the green beans or would do they need different temps/cook times? Thanks! I’m not sure but I think it would be OK if the mushrooms were whole . Love it! I’m addicted to green beans. Even easier on a daily basis is I buy the ones that go into the microwave. Take them out sprinkle with truffle salt and a little parmesan. Back in for another 30 seconds and ready to go! That looks delicious! Roasted Brussel sprouts are one of my favourites, so I definitely have to try your beans recipe now. Thanks for posting! Hey gina, Do you think these will get too soggy if I make them and then carry them to a potluck dinner? They would be best eaten right away. I'm thinking these beans or the asparagus might make a good snack food if they are dehydrated after roasting. Really, really excellent. I will make this again. Served it with your Chicken Francese. 8 point dinner. Thanks for a great recipe and for including the WW points. I am searching for Slow-Cooker Chicken Tortilla Soup. 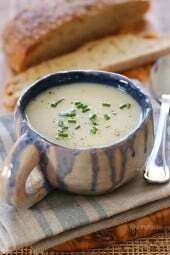 Do you have this recipe? Just made these tonight and they were amazing! I could have eaten the entire pan! These are really good with a little bit of cajun seasoning on them too. My husband asks for them almost daily! Being a southerner, I really like "mushy" green beans, haha! BUT, these look fabulous too! I love roasted veggies, so I will be trying these soon. Thanks for the recipe! Love your whole site. I just made these tonight. Went great with a sweet potatoe. My boyfriend loved them and its a chore to get him to eat anything vegetable-like. So easy. So yummy. Will be making these again. Thanks! Made these the other night to go along with my horribly fattening Pioneer Woman's alfredo with rotisserie chicken and they were honestly my favorite part of the meal! I bought a bag of pre-snipped beans at the store and had just enough left over for the next night (and they were still just as good microwaved)! Thank you – this is my new go-to side dish. I'm going to try cooking asparagus and broccoli the same way. Made these last night to go along side bourbon pork with rice. Yum. YUM. YUM YUM YUM YUM YUM!!!!! Gina, I'm the opposite of you. I usually am not a fan of the crispy beans unless they are done just right. This recipe was perfect. Definitely a repeat keeper! For those wanting to use frozen green beans I would first cook them the way I cook my frozen veggies. So often frozen veggies are soggy so I saute mine on low to get rid of the moisture. This would be a good way to prep them for this recipe. I make a veggie pizza that I use frozen stir fry veggies in and prep the veggies this way. My family LOVED them! Thank You! OMG, this looks absolutely delish! I can't wait to make this! I'm celebrating my birthday with a recipe link up and a spicy giveaway that include 4 oz of each of these spices: ground chipotle, ground cardamom, ground ceylon cinnamon, oregano, granulated garlic, and whole cumin. I'd love for you to stop by and link up this recipe and any other's that use one or more of these spices. TGIF! I heard about your blog/website today at a WW meeting. I could spend LOTS of time here, maybe TOO much time. I make these beans all the time & we love them; though I've never added parmesan. We call them 'bean fries'. lol Do you post WW points plus on your recipes? Thanks and I can't wait to keep exploring. I made your recipe tonight. Delicious and simple! I used cooking spray instead of oil to cut calories and fat. It turned out great! Thanks for posting. Just had these for supper and they were a big hit. My family was asking when we were going to have them again. Just made these for dinner and omg soo good! I showed the recipe to my mom and we were wondering if these would be a smart idea to make for a huge event…say a reception for about 150 people? 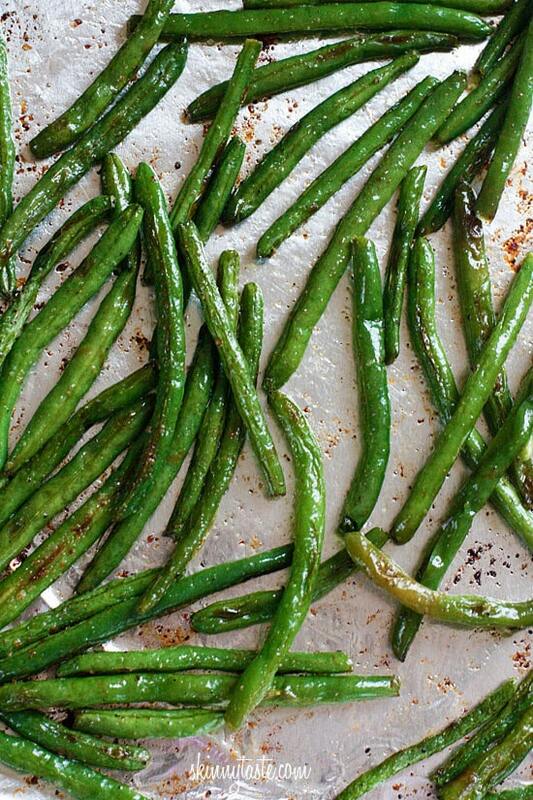 Do the green beans stay crisp and tender if we had them in a roaster pan for a few hours? Made these last night – it was great! 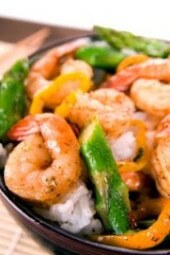 Rather than use olive oil, I used Olive oil cooking spray very lightly to lessen the calories. The green beans did perfectly well with just a light spray, rather than a drizzle of oil. I will definitely make these again. YES, I do sweet, russet and red potatoes sliced thin, green and yellow zucchini, and red/orange/green bell peppers all in the oven all roasted this way. I even do onions quartered! The house smells awesome when we roast veggies. I made this beans and it was hit with my 6 yr old! loved it. Yummy! My version of this recipe has fresh garlic chopped fine and a little lemon jucie drizzled over after it comes out of the oven. Haven't tried it, but I'm going to this year. This was very good and quick. I like quick recipes. I used frozen green beans instead of fresh it still turned out good. I would not use frozen beans, too much water in them. These look amazing! This is meant for fresh string beans. Can you use frozzen green beans? 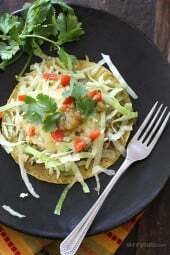 Made these last night and so easy and yummy! Living alone its hard to find quick, easy, HEALTHY and yummy veggies besides salad. Definitely will make these again! I made these tonight, along with the Lighter Chicken Saltimbocca. Both were absolutely delicious!! I don't think I'll ever make green beans another way. So good! I even topped them with leftover proscioutto from the Saltimbocca. So delicious! Made these last night with the bacon topped petite turkey meatloaf with the bbq on the meatloaf. Excellent combination! Loved these beans as did the boyfriend. going to pair this with the bacon topped turkey meatloaf, tonight. I wish I had green beans ready from the garden but, oh well. I hope it all works together. Best green bean recipe ever! Frozen- should i thaw them first? Parmesan- can we use the shaker kind instead of fresh grated? Fantastic!!! I'm not a big fan of veggies and have been looking for ways to introduce more into my meals. This recipe did the job!! I LOVED them!! Thanks for the great recipes, Gina!! If using frozen green beans, should I thaw them first, or just prepare them right out of the freezer? thanks for the recipe – can't wait to try it!